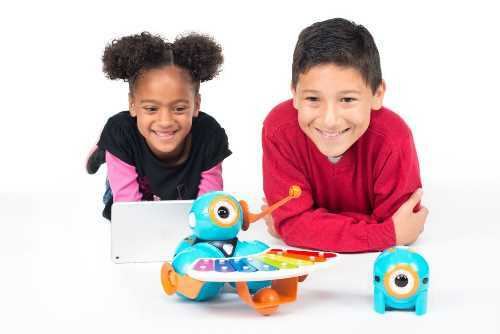 Two adorable robots entice kids to play and learn coding. Irresistible robots take kid-coding to new heights. Dash and Dot are two fully-assembled robots that kids can play with straight out of the box. Both have one eye and can talk. Dash can move about and he will say things like "Look at that" when he bumps into something or whistles as he explores. Dot is a stationary robot that makes sounds and flashes its lights. When you turn Dot face down, you hear "Face plant!" The Dot & Dash Robots are both very engaging and sound adorable. The two robots interact with five free apps, so that kids can play with them in many ways. The robots can go on missions, play games, run through mazes, communicate with each other, and even be taught to play a xylophone. Kids create programs on their smartphone or tablet to control one or both of these friendly robots. Dash is made from three balls on the bottom and one more situated on top. This robot moves with precision in any direction, talks, lights up, and has an assortment of sensors (it hears sounds, detects objects, and sees movement). Dash can be purchased separately for $149.99, or with Dot for $199.95. Parents can also buy Dash & Dot as part of a bundle with fun accessories for the robots, including a tow hook, a pusher bar, and a Dash xylophone and mallet (so the little robot can get his rhythm on) for $279.99. Dot is a one-ball robot who is stationary but can talk, light up, and communicate with Dash. You can purchase Dot as a standalone robot for $49.99. Also fun is a separate add-on called the Wonder Workshop Launcher for Dash Robot ($29.99) that gives Dash the ability to fling balls at targets. Players use the Go for Dash & Dot Robots app to set up the robots. Kids draw paths for Dash, and set the colors and patterns of both robots' lights. There is a pictorial grid of sounds to select from, but you can also record what each robot says. Players draw a path for Dash to follow and then add nodes to give it special abilities such as making sounds or doing specific behaviors. New abilities unlock the longer you play. While kids can figure it out by experimenting, I think the app could use a more kid-friendly interface. This app provides kids with a picture-based programming language to use for both robots. At first, kids learn how to write code for these robots by going on structured Scroll Quests. These quests teach kids how to program their robots while scaffolding their learning with hints and help. As they complete quests, players unlock new abilities for the robots that they can use in a Free Play area of the app. One quest for Dot involves stringing a series of commands together so that Dot turns into a scanner. By programming the robot's 12 lights surrounding its "eye" to turn on and off in sequence, it appears as if Dot is sending out a circular beacon. With Dash, a sample quest has kids programing the robot to go in a circle saying "Hi" to friends. After kids complete a program they like, they can transfer their coding to the robots to change their standard behavior. Wonder is my favorite of the apps, because it does a good job of systematically teaching kids how to program these robots, and then sets them free to apply what they have learned to new ways of programming and playing with the robots. 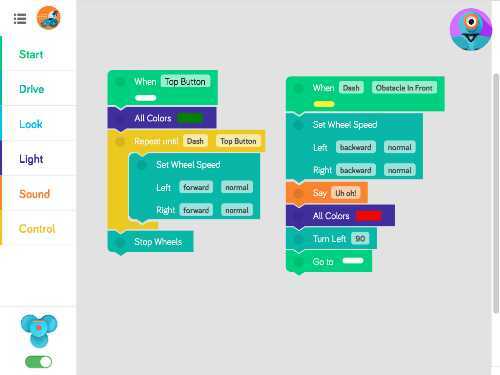 With the Blockly app, kids program the robots using the visual drag-and-drop language developed by Google. Kids snap blocks of commands together to create programs. The app comes with a set of structured coding puzzles which serve as a tutorial for kids who want to practice before starting their own coding project from scratch. Part of the fun is how Dash celebrates by dancing and flashing its lights every time the player completes a puzzle correctly. These robots make you feel good! If you purchase the separate add-on xylophone (for $39.99), Xylo for Dash Robot enables players to teach Dash to play music by attaching a mallet and then programming the robot's movements so that the mallet hits the musical instrument to play songs. Children can also play this xylophone independently. While expensive, these tech toys deliver a lot of charm and learning. The robots are such fun to play with that your kids will want to learn to code so they can watch or film these robots doing both silly and clever things. In the process of figuring out how to make the robots do their bidding, kids will use logic and problem-solving skills, and will learn to debug their code. With the motto: "I wonder, therefore I am", these robots encourage out-of-the-box thinking. And Developer Wonder Workshop encourages creative exploration by hosting a YouTube channel where kids can watch other children's designs and upload their own. 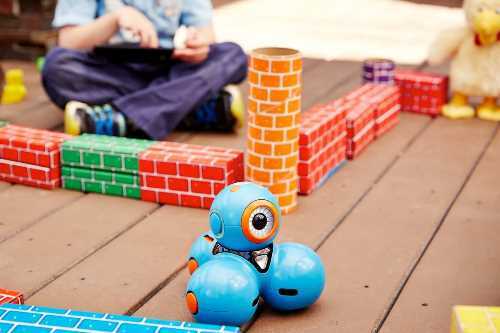 Instead of learning coding in a flat digital world found on a tablet or computer, this toy lets kids learn to program by playing with real 3D objects -- in this case, adorable little robots made of balls. These robots are compelling to play with because they are so responsive. They talk, flash lights, blink an eye, and, in Dash's case, move in silly and engaging ways. His dancing is not to be missed. Because the robots Dash & Dot are irresistible, kids are motivated to learn how to control them through coding. Dash & Dot is one of the most innovative tech toys of the year! Kids as young as age 5 can play with Dash & Dot using the simple Go app. But the real fun happens for kids who can read and are ready to learn coding. The sweet spot for using the Wonder and the Blockly apps is around ages 8-up. With these two apps, if kids can think it, they can program it. This Dot & Dash Robots tech toy review was written by Jinny Gudmundsen.